Coucou Brooklyn is proud to present a very special night dedicated entirely to the French singer Serge Gainsbourg, featuring a retrospective musical performance by brother singer-songwriters Jason and Jared Saltiel, as well as an exhibition of large-scale portraits of the artist by local painter and long-time Gainsbourg fan Spero Plagianos. Known for his omnipresent gitane cigarettes, his penchant for heavy drinking, and a turbulent romantic history with some of the most beautiful women of his time, Gainsbourg is one of the most celebrated figures in French culture. 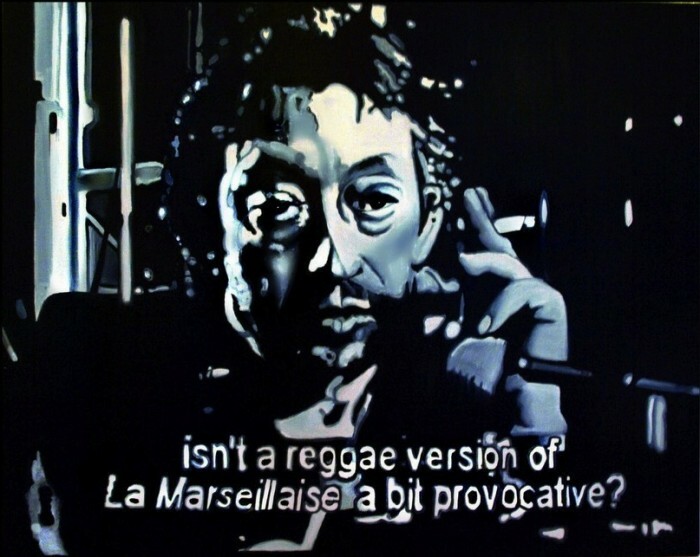 But behind his canonized image as a lovably louche singer, Gainsbourg was the ultimate outsider, and a master songwriter far ahead of his time – from his ironic exercises in pop music to the groundbreaking literary edge of his twisted masterpiece “Histoire de Melody Nelson,” Gainsbourg’s music was always an unholy marriage of intellectual prowess and perversion, and his work anticipated the rampant cynicism of today’s pop culture by an entire generation.